There are years when I feel as though I've missed Spring entirely. Believe, me, true Spring (with a capital S) is a fleeting season in New York City, just a week or two crushed between the bone-chilling rainy days of late winter and the months-long oppression of summer's filth-tinged humidity. I'm really going to pay attention this year so that I can make the most of Spring's brief delights. Never mind the deadlines (and oh, do I have deadlines for the next few weeks!) — I've been forcing myself to go outside for afternoon coffee breaks and I've already bought my tickets to Sakura Matsuri, the annual cherry blossom festival at the Brooklyn Botanic Garden. I even have my perfume picked out: Dawn Spencer Hurwitz Gekkou Hanami ("Sakura Gazing in the Moonlight"). According to the DSH website, “Hanami is the Japanese pastime of picnicking below the Sakura cherry trees while in blossom. The act of gazing at the blossoms as they fall like snow is an essential moment of beauty, and death." This fragrance is described as "a fresh, Spring-like aroma suffused with classic Japanese cultural references," including notes of sake, yuzu, osmanthus, hinoki, cherry blossom, frankincense and cedar. Gekkou Hanami unfolds like a geisha's painted fan, segment by segment. It starts with a wedge of bitter citrus, followed by a raspy green note of galbanum. (Hurwitz used a similar green tone in Jacinthe de Sapphir, if I recall correctly.) Its heart is an arrangement of spring florals. There's a soft rose (love!) and some honeyed lilac, all very April-appropriate. If you admire Hurwitz's treatment of lilac in La Belle Saison but find the price a bit steep, you may want to sample Gekkou Hanami. The cherry blossom is there too, in addition to the green foliage and roses and lilac, although it's more subtle than I expected. It reads as something delicate and distant, not quite powdery but not quite creamy. Today I tried smelling a few cherry blossoms from a tree that I passed on my way to work, and they didn't have much scent; perhaps they're meant to be contemplated rather than sniffed. I've never cared for the cherry blossom fragrances offered by mass-market brands like Bath and Body Works, so it's not surprising that I prefer Hurwitz's light, impressionistic interpretation of this very picturesque bloom. For a gentle floral, Gekkou Hanami is surprisingly long-lived on my skin: it lasts about six hours, and then I happily re-apply it from my sample vial. I'm reserving a few drops for Sakura Matsuri later this month, but I'll be sure to get out and admire more "real life" flowers in the meantime. Dawn Spencer Hurwitz Gekkou Hanami is available in a variety of sizes and formats, including bath and body products; the 30 ml Voile de Parfum is $90. For buying information, see the listing for Dawn Spencer Hurwitz under Perfume Houses. Note: top image is Little Buds [cropped] by Jocelyn Kinghorn at flickr; some rights reserved. Wonderful review, Jessica! And this fragrance sounds lovely. Thanks for letting us (me?) know about it. I think it was Robin who just recently mentioned lilac scents on a SOTD post. I’m still an En Passant fan, but I’m always open to trying other lilac-y or spring-y floral scents! and I do like the combination of notes in this one. NYC is really beautiful this week. I’m trying to savor it! This really sounds fresh and lovely! In a lotion would be great! Actually, Dawn does offer many of her fragrances as body lotions, body cremes, and body washes. I just checked her site – yep! – body products are available for Gekkou Hanami! I own a number of her fragrances as body cremes, and they are very moisturizing and long-lived. Yes! She often offers matching body products for her fragrances. Endless possibilities! 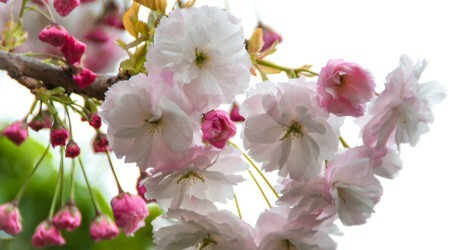 I like the sound of that, a cherry blossom with galbanum, a rendition that does not smell like a little girl’s shampoo. Can’t wait to try. I know… I can’t stand L’Occitane’s Cherry Blossom products, for example, although I’m generally a L’Occitane fan. I’m trying to remember where I once read a comment about many cherry blossom perfumes and body products smelling like scented female hygiene products (I believe “pantyliners” was the specific reference) — apologies for this train of thought, but it still rings true for me! Thanks for the review. How noticeable is the frankincense? Hi Kindcrow! I didn’t pick up on it at all — it’s really more of a green-then-soft-floral scent for me! Cherry blossom season is my favorite (all-too-fleeting) moment of the year, and Dawn’s tribute to it sounds lovely.